So much has been said about this Aries Full Moon to scare the crap out of everyone! Methinks we are still waiting for the other shoe to drop in this revolutionary, evolutionary year 2012. Yes, this moon aspects almost every planet and yes this has been another gamechanger month with many planets changing signs or moving forward, solar flare activity, new comets found out there and star formations reoccuring from ancient times. Yes, we have had the second snap of the whip Pluto/ Uranus square. So, yes, these are challenging times because change is everywhere… yet miraculous new alignments are occuring right before our eyes in all departments of our lives if we slow down and look up at our glorious world. Let us not forget that the amazing Autumnal Equinox heralded in this cosmic bonfire moon. We are living our lives by the moon cycles, eclipses, equinoxes and solstices just like the ancients. This turning of the wheel of seasons connects us to Mother Earth and Father Sky. Without this dynamic connection with nature the human race is lost… has lost its way. We are finding out way again only we are not going backwards yet forward into time that no longer exists! A truly wild ride! All these grand shifts are parting the energetic seas and making way for that which is only aligned with the LOVE vibration. To stay in the LOVE vibration and to actually raise our earthly foundations to meet this new energy we are challenged to practice non-judgement, acceptance, and allowing. The only way to do this is to let others experience their own reality, their own choices. We must step back now and LOVE others so much that we allow them to be sovereign. Even if this looks like tough love sometimes. The over-helping must stop, the unwanted interference is sooooooooo unwanted and really not needed now because these gamechanging times are here to stay. Being an Aries myself, I have taken this time as a great initiation in my life. So, the five days before the Aries full moon and the five days after are special days for me where I let go of the glamour of the past and look ahead to find my next calling. I slow down and consciously do less and honor those people who support me, get me, laugh with me not at me and love me. All the others in my life, I let go their own way without resistance. I suppose, I am loving myself so much that I do not let others errode my confidence in me because I realize that their pain is not mine. Once you understand that most people are projecting their own pain onto you, you can shake it off. You can laugh it off. You can experience real emotional freedom. 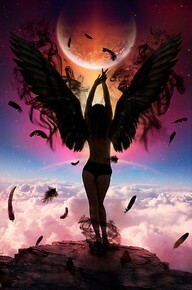 I believe this is the true awakening of this grand shift of 2012 and the promise of this Full Moon in Aries. This fire moon is unpredictable because it illuminates Spirit, the unseen, that which lies below the surface yet burns brightly within. Take some time in the next few days for a personal ritual. Meditate with a candle. Dance around a bonfire on the beach. Walk an illuminated labrinth. Let the fire in our hearts move us forward into action instead of the frillfull, lost dreams in our heads. These days are very intense for most people. Yet, there seems to be a common theme running through the ethers. That theme is a letting go into the Divine within us. What does that mean? Sometimes we want something so much that we are willing to compromise our very being, our very soul to attain it. Whether it be prestige, money, a marriage partner or love interest, our freedom, or some material object we think we should have, in the past we have muscled our way to get it. This will not work now. Now we are operatng on a different energetic wavelength. We are moving from carbon-based beings to cobalt beings. We are morphing inside and out. This is evolution at mach speed. To achieve this not so distant goal, we are re-aligning with our souls, the Divine within us. How are we doing this? By making a conscious decision to master all departments of our lives. If we do not make this descision consciously, if we remain stubbornly asleep, wish to remain in the past or long for the ‘good old days’ we are NOT embracing change. We are fighting it. It is here no matter what. 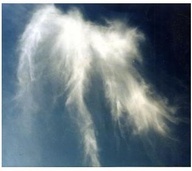 We cannot ignore this intense energetic movement which is playing out all around us. Fighting change or trying to ignore it will only result in pain. Mastering all departments of our lives means aligning them ALL with the Divine with us. Soul alignment. This is what is happening now. Bottomline: Anything that does not resonate with our souls, the Divine within us, goes! This may look chaotic in our personal lives if we choose to fight it or ignore it. If we choose to see the ‘Big Picture’ and know that release will make an immediate space for Soul Alignment we are at peace with all the changes in our lives. So the thing to ask ourselves when we are in the midst of fighting for/against something or someone or trying to ignore our gut feelings about something/ someone is: Are we holding on to an ego driven action? If so, there is some hidden agenda in ourselves. Struggle is an indication that we are in resistance to the Divine within us. Letting go of the struggle creates inner peace. This is just as true in relationships as in doing business. Everything is changing now. If you are not authentic and heart- centered you will remain in the struggle. The answer to this simple question will bring resolution to any situation- WHAT WOULD LOVE DO? Let’s take time to ponder this question all throughout our day. All the moons are super- powerful now. They affect not only the tides but our very being on this gorgeous, green/blue jewel of a planet called Earth. This Virgo New Moon heralds in yet more deep, heart-felt change as many astrological aspects gather in the skies to change signs, T-square, change direction, dance and celebrate the Autumnal Equinox. Pluto leads the charge into this millinium as The Lord of Transformation stations direct at last and reveals to us all just where we give over our power. As Ramtha says, our beliefs stand in the way of our soul growth. So, another layer of examining our personal belief systems is on the table. What is working for us? What is not? Are we letting our egos hang on to something or are we listening to the Divine within us? Have we slowed our minds and breath enough to hear that Divine voice which is within all of us? The All That IS, The Field of All Possibilities, The Divine Within Us is becoming firmly rooted in this shifting reality and in our very beingness. It is the time of Aquarian ideals: Peace, equality and prosperity for all. This New Moon in Virgo speaks to us all about the real things in our lives. The false gold as opposed to the true gold that forges our souls. What is just a temptation? What is good for us? What is our TRUE gold? What is our true, heartfelt joy and gift to offer the world? “Get Real” could be our motto for this autumn! This may appear to be a time of increasing chaos yet it is just the widening of polarities. Some are moving in one direction, others in another. Instead of judging, let’s look into our own hearts and move toward those who are aligned with us. There, we will feel at peace, welcomed, supported. We will belong. We will be learn to be Sovereign!!!! We are all leaning to share ourselves and give. Let us fall into our full power and integrity this Fall!!!! 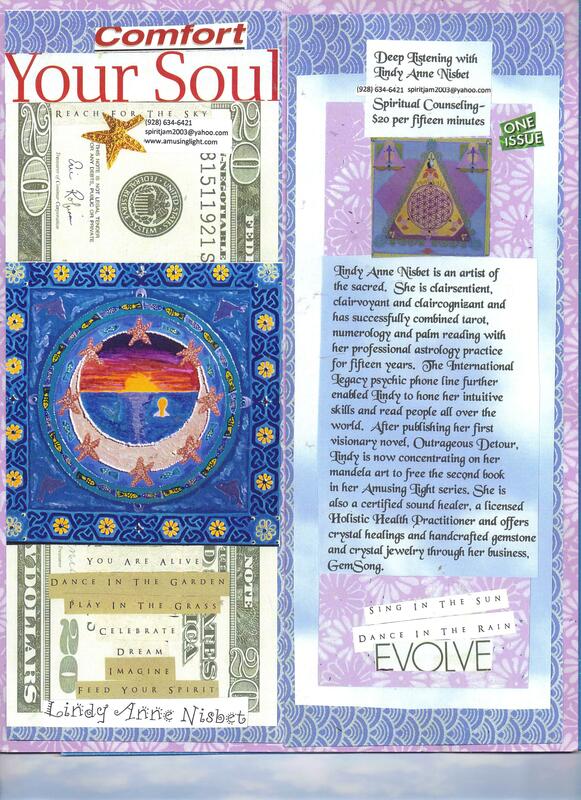 This is a flyer I used in Laguna Beach, CA when I was working there as an HHP, painting mandalas and giving angel readings. I do miss the ocean alot! Yet, here in Sedona, I have found a great alternative: a wonderful salt water pool! I try to swim every other day for at least an hour, sometimes more, because I never wish to get out of the pool! For me, I find the embrace of water to be grounding. It calms my nervous system during these highly energetic times as we head toward the end of 2012. I find swimming in salt water and flower essences, the high vibrational medicine of the 21st century, keep me grounded and joyful. If you feel the call, swim, get in the water!!! Plus, I have just run across some very powerful energetic herbal remedies by meeting Gail in the pool! For more serious physical conditions, please look at www.emethy.com and talk to Gail!! !